NEW YORK (WABC) -- Things are finally looking up for the New York Giants. The only positive following a 3-13 2017 season is that Big Blue finds itself with the second pick in the NFL Draft. On Wednesday, the Giants got the news they needed when the top two quarterbacks made themselves available for the draft. 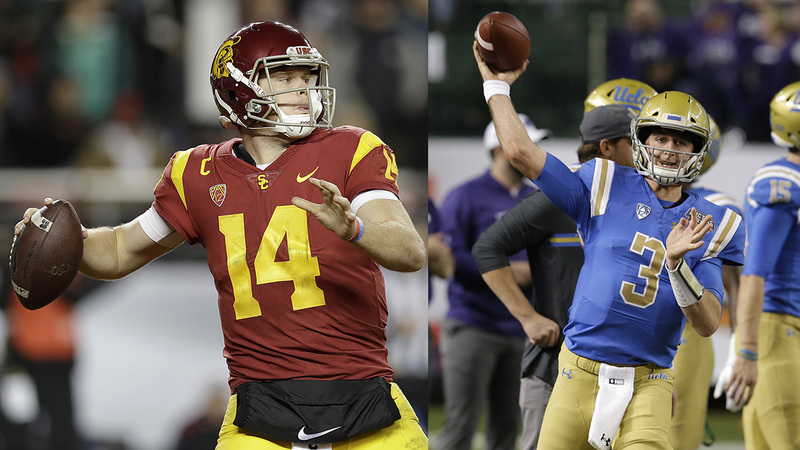 UCLA's Josh Rosen and USC's Sam Darnold both announced they are leaving school early, and the Giants could not be happier. One of these signal callers will be available when the Giants pick. On paper, Rosen appears the more ready to step in and play right away. But the Giants do have the luxury of having Eli Manning under contract and could elect to have either one sit for a full or part of the season and learn from Manning. The Giants must make the move here to grab their franchise quarterback of the future. The last time they had the second pick was back in 1981, and they selected a linebacker from North Carolina -- Lawrence Taylor -- and the rest is history. So what if new Giants general manager Dave Gettleman does not believe in either Rosen or Darrnold? Or better yet, feels that Davis Webb is the future? That puts the Giants in position to trade out of the spot and get multiple picks to rebuild faster.